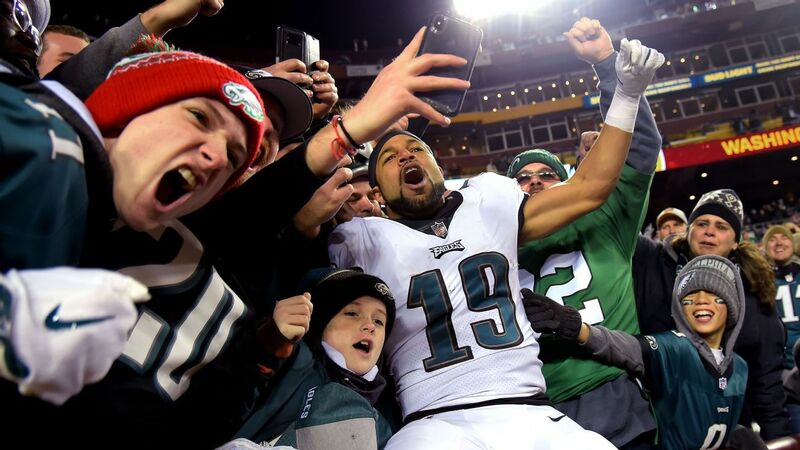 PHILADELPHIA — Philadelphia Eagles wide receiver Golden Tate made a couple waves this week with a post on social media that was both cryptic and revealing. It’s telling that Tate is focused on the extension element at all at this stage in the process. The official start of free agency is just one month away. It’s an opportunity for Tate and other veterans to test the open market and establish value. With the risk of in-season injury behind them, there is almost no incentive for free agents to re-up with their current teams at this juncture unless they’re blown away by an offer. The fact that it’s on Tate’s mind shows where his priorities lie, and signals that the situation in Philly aligns with those priorities. He spoke about how his mentality is different entering free agency this time around during a recent interview with ESPN at the Phoenix Open Pro-Am. The 2018 season presented a unique challenge to the nine-year veteran. He was dealt from the Detroit Lions to Philly at the trade deadline in late October for a third-round pick and had to learn a new system on the fly. It was a struggle to get him integrated into the system and his production took a hit across the board. But both he and his young family grew comfortable in their new surroundings. Tate appreciated the way he was accepted in the Eagles’ locker room, and the way he and his wife were surrounded by support outside of football. He became more familiar with the offense as the season went along and scored the game-deciding touchdown in a wild-card playoff win over the Chicago Bears. Tate expressed a desire to remain in Philadelphia at the close of the season. Executive vice president of football operations Howie Roseman, meanwhile, spoke well of Tate at the end of the year and stood by the decision to deal for him. “When we made the trade, we were 4-4. We were looking for a spark. We were looking for more firepower on offense. When you talk about Golden, here is a guy who has incredible character, incredible production, can really fit any scheme. Everyone in this building was incredibly excited about adding him to our football team. We knew the price to pay,” he said. Even though the year ended on a positive note with Tate, there’s logic to the Eagles moving on from him — particularly if they remain committed to fellow slot receiver Nelson Agholor, who is due to make more than $9 million in 2019. What the Eagles really need is an outside speed receiver, and they are more likely to use limited free-agent resources on that position rather than double up in the slot. If that’s the case, Tate will be on the lookout for a new home, one that he hopes looks similar to his current one. But he shouldn’t have a hard time attracting suitors. Tate had more than 90 catches and 1,000 yards in each of his past two full seasons with the Lions, and has missed only two games since his rookie year. He believes his production over the long haul will be kept in mind as teams consider the statistical drop during the second half of the 2018 season while making a transition to a new team. ESPN’s Josh Weinfuss contributed to this story.